Tusk said that an extension could be granted in writing if EU leaders approved his proposal and Britain's parliament voted in favor of the withdrawal agreement. BRUSSELS — European Council President Donald Tusk said on Wednesday that granting Britain a short postponement of Brexit was possible on condition that Britain's parliament votes in favor of the stalled divorce agreement next week. 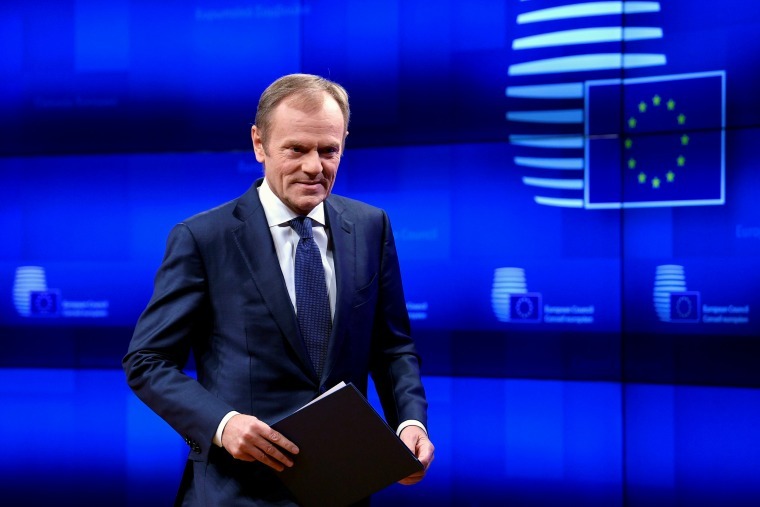 Should that happen, Tusk said no extraordinary EU leaders' summit would be needed next week before the current Brexit date of March 29. Otherwise, he might call the 27 national leaders of EU countries staying on together after Brexit back to Brussels. "In the light of the consultations that I have conducted over the past days, I believe that a short extension will be possible, but it will be conditional on a positive vote on the withdrawal agreement in the House of Commons," Tusk told journalists before chairing the EU leaders' talks in Brussels this Thursday and Friday. "Prime Minister May's proposal of the 30th of June, which has its merits, creates a series of questions of a legal and political nature," he said. "However, if there is such a need, I will not hesitate to invite the members of the European Council to Brussels next week," he said, referring to the "European Council" gathering of EU leaders.